The “Smart Dimension” is another important sketch tool in SolidWorks. It helps to correct or modify the dimension for sketched part according to your idea or paper drawing. You can find the Smart Dimension tool at the sketch toolbar manager. It also helps to notate the dimensions of the designed part or products as per the engineering graphics rule. This tool down menu contains tools specifically for Horizontal, Vertical, Ordinate, Horizontal ordinate and Vertical ordinate dimension tools. Smart Dimension Uses: Create dimension for one of more selected sketch entities. To see this SolidWorks Sketch tutorial, first create new part file and then draw a line, rectangle and circle roughly in the sketch area. Don’t bother about the dimensions, only need rough sketch, which is shown below. Select the “Smart Dimension” button from the command manager. First you will see how to modify or mark dimension of a line. You know that a line contains two end points and length is represented between them. First select the Point 1 and then select Point 2 (both points marked in above image). Then drag the mouse button up or down to fix the dimension marking and click left mouse button. Then a Small dialogue box will appear and named as “Modify”. Here you can change the dimension name, enter the length of line, you can reverse the sense of dimension and reset the spin increment value. As a beginner don’t worry about the other options in the Modify dialogue box. Just enter the value of dimension and click on the green tick button. To represent angle between two lines, just select the two line entities and automatically convert into acute or obtuse angle representation according to your mouse position. That is if your mouse pointer inside the two lines, represent acute angle, otherwise obtuse. Rectangle contains both horizontal and vertical lines. The smart dimension tool is enough to represent the each type of line to complete the dimension representation of rectangle. Like the Line tutorial, just select the two end points of any one of the horizontal lines and modify it. This is the length of the rectangle. Then select the two vertical points to modify the width dimension of rectangle. To represent the diameter of the circle, just click on the circle curve and it smartly select the diameter of the circle. Then you can see the Modify box to adjust the diameter. To represent or modify the radius, first you should draw a radius line form the center to any point of the circle. 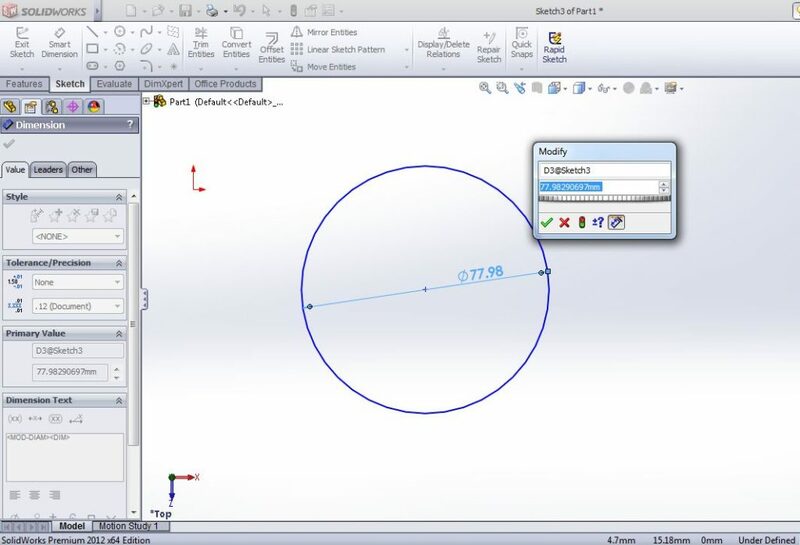 Then select the two end points of the line and modify dimension to represent the circle radius. 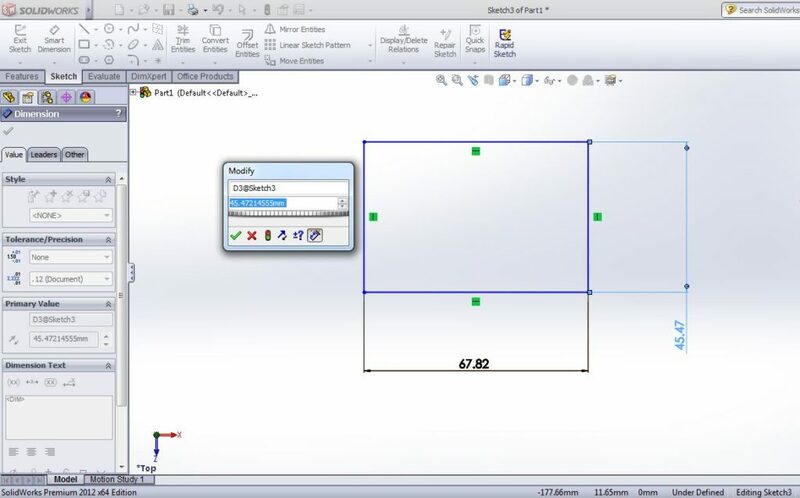 This is a SolidWorks tutorial just showing how to use the “Smart Dimension” tool to create dimensions in the sketch entities. You please note that to modify the dimension of any sketches, better to use the property manager. The property manager of each sketch tool will appear, when you just select the sketch using the select tool. These tools are also applicable for other sketch tools dimension modifications.